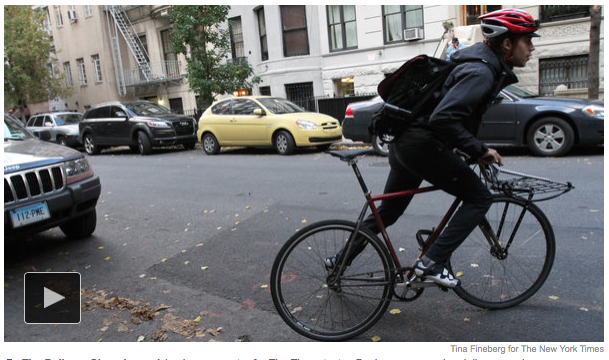 There’s a hot new job in tech: delivery guy. According to eBay’s job description, he is a “valet,” dispatched on Manhattan streets as a personal shopper on a bicycle or in other cities in a car. The app for eBay Now, the company’s local shopping service, promises that valets will complete a shop-and-drop-off not just in the same day but “in about an hour,” a timetable crucial to the company’s intensifying efforts to one-up Amazon in the delivery game. It wasn’t so long ago that overnight delivery seemed amazing enough. Then Amazon started building huge warehouses — what it calls “fulfillment centers” — near major cities to be, in a spokeswoman’s words, “as close to customers as possible.” With 40 such centers in the United States encompassing more than 80 million square feet of storage space and employing 20,000 full-time workers, Amazon offers same-day delivery in 11 cities.